Register now and prepare for 22 weeks of soulful self-reflection as you encounter your Self -- the One and the Many -- through the Tarot Journey. Led by Stephanie Anderson Ladd, SoulCollage® facilitator, archetypal explorer, psychotherapist, artist/writer/teacher/seeker, who will be joining you on the journey and providing a safe container for self-exploration. Your course is worth every penny. So user friendly, packed with understandable info, and I love seeing all the different tarot decks. Combining it with SoulCollage® helps make all the info personally meaningful.It's a lifetime study!! - Mary M.
Three of us from our small SoulCollage® group took your wonderful class together... Your weekly lessons have been brilliant and inspiring. They burrowed their way into my psyche to pull out some of the most creative aspects of myself. I am truly grateful for your expertise and for this class. It was soul satisfying and so much fun! I waited each week in anticipation for the next card. - Nancy A.
I loved it! Plain and simple. SoulCollage was not new to me, but the world of Tarot was. I knew nothing. You not only educated me on the 22 Major Arcana, but on how they all play a part in my own life’s journey. Every week (for over 5 months!) I read over your files and savored the pictures of other Tarot card decks. I kept the specific archetype’s attributes flowing around in my head all week until I was finally able to wrangle them in and create the card that spoke to me personally. I don’t see how anyone could not come away from this course a changed and BETTER person. Your words, journal prompts, and the myriad examples you supplied compelled me to look deeply at who I was and who I wanted to be. We were encouraged to look at what we didn’t like about ourselves, and either accept it or change it if we chose. We also learned to love ourselves. You created an online community of insightful, kind and supportive women. I’m so grateful that I got to be a part of this experience. - Renee D.
Brand New Course Starting Soon! I started this course as a mostly beginner. I have gotten so much out of it. My confidence in approaching the cards in general has increased. I am using my cards more. I find that as I travel through life and its lessons, the image or name of a Major Arcana card will come to mind, shedding insight and Light onto the situation. Thank you, Stephanie Anderson Ladd, for this course. You created a safe vessel to explore the cards both inwardly and intellectually. 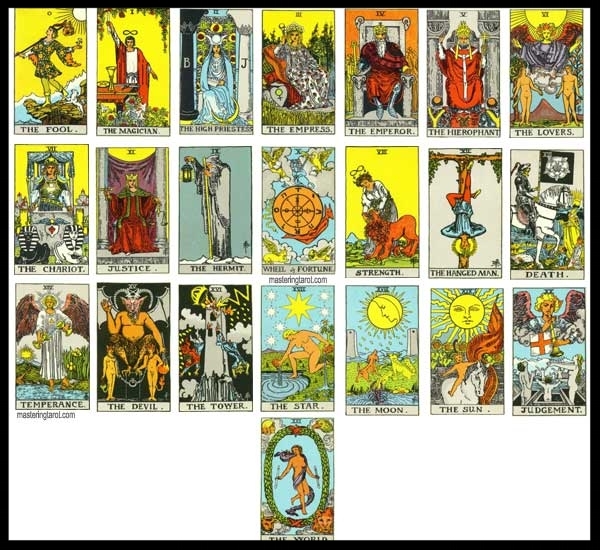 I love the practical depth you brought to understanding the Major Arcana and thus all the cards. I loved this group. - Janhavi M.
I especially appreciate the connections made in this course between the tarot trump cards and astrology, the chakras, relevant gods and goddesses, Jungian archetypes, and other modalities. It's been a wonderful complement to our SoulCollage suits.... This truly has been a master class enhanced by the contributions of so many in the group. Thanks to all! - Karen R.
I have learned much more than "Tarot", and understand how I can draw on ancient wisdom and knowledge patterns in forming my consciousness. Thank you, Stephanie, and to all my Tarot sisters. - Mairim G.
Thank you so much, Stephanie, for your inspiration and dedication in putting this course together. It feels like I have found a community of like-minded soul sisters, and I am truly grateful. It's hard to put into words how much I have learned because a lot of it expresses itself through subtle connections that I am still making. And perhaps it's too soon to say how much - I am certain that it will be many months in the gestation! - Ruth G.
Stephanie, I LOVE this class!! Thank you for all your insight, wisdom and enthusiasm!! I also loved all the connection and creativity of all the women who participated!! Thanks! - Vicki W.
I have been touched deeply by your teachings as well as everyone's contributions. The cards and accompanying insights have been profound and soul-stirring. - Lisa P.
What a creative, thoughtful, wise group we've had, and such detailed, rich, incredible teaching! - Lynne L.
Thank you Stephanie for your brave and beautiful leadership as you've guided us on this amazing path into our souls. - Kathy A. If you haven't ever tried SoulCollage®, here is a short tutorial about how to do it. You don't have to be a trained artist to make beautiful, evocative images. It's as easy as cutting and pasting--something we learned to do as children, and playing with this art form will bring out the playful, happy child in you. Learn about SoulCollage® and how to make your first card with Seena Frost, Founder of SoulCollage®, and Mariabruna Sirabella, Senior Trainer and Translations Coordinator. Seena and Mariabruna talk especially to those who have never heard of SoulCollage®. They show you how easy and fun it is to make a card and talk about discovering your inner wisdom. You may want to start collecting images now so that you have plenty to choose from, or get together with friends or other SoulCollagers and share the bounty. Look for images in magazines (National Geographic, Smithsonian, spiritual and women's magazines are great sources), calendars, cards, and old illustrated books (I look for these at thrift shops and yard sales).